Complete Aeration System: When there isn't enough oxygen circulating in your pond's water, it can lead to foul odors, algae growth, mosquitoes, and even fish kill. Our aerator pump quickly boosts oxygen levels and can even be used as a de-icer in the wintertime! Incredibly Powerful: The AirPro water aerator brings results you won't find anywhere else! Able to aerate ponds up to 1 acre, the super-strength rocking piston compressor operates up to 50' deep while the motor draws 1.7 amps and pumps 2.3 CFM of air. Completely Safe: Although it's able to deliver efficient results, our affordable pond air pump maintains total safety. The system operates without running electricity through the water, so there's no threat to wildlife or to your family during water recreation activities! Superior Quality: Made of durable, long-lasting materials, you'll be able to rely on our pond aerators through virtually any season and weather condition! 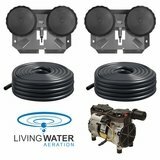 Your order includes a 1/4 HP compressor, 100', 3/8'' weighted tubing, and a single head membrane diffuser. Unbeatable Warranty: When you purchase from Living Water, you can shop risk-free! Our compressor comes with a 2-year warranty, while the tubing and diffuser come with a 5-year warranty. Our customer service team is standing by to handle your questions. The Simple Solution for Pond Aeration! If your pond is prone to algae growth or if you have experienced a fish kill, chances are there's insufficient oxygen circulation in the water. Hot, cloudy weather and waste decomposition are just two of the many factors that can lead to these serious problems. 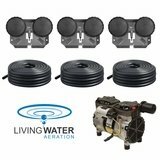 To make maintaining your pond easy, Living Water Aeration introduces the AirPro Pond Aerator Kit! This complete system efficiently pumps air into your pond, eliminating numerous issues like foul odors, mosquito hatches, and bottom muck. Over time, it helps improve fisheries by expanding oxygenated habitats for a clean, healthy environment! The secret to our kit's success is in the whopping power it provides! It aerates ponds up to 1 acre in size, operates up to 50' deep, and draws 1.7 amps and pumps 2.3 CFM of air. Despite these powerful components, the system doesn't run electricity through the water and features GFI protection on all circuits, so the pond remains safe for humans and wildlife alike! 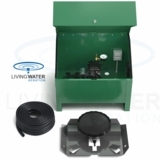 At Living Water Aeration, we bring high quality manufacturing together with affordable prices! Our system includes a durable 1/4 HP compressor, 100', 3/8'' weighted tubing, and a single head membrane diffuser for a system you can depend on. Why Choose Our Aeration Kit? There are several options for this kit as you can see above the add to cart button. We have an option for additional air tubing if needed, also this system can be equipped with a second diffuser. If you do opt for the additional diffuser keep in mind that a valve manifold is needed to regulate the air flow to each diffuser. Also if you are interested in a weatherproof housing for the compressor please see the deluxe version of this system. I have about a 1/8 of an acre pond and this pump puts out an incredible amount of air bubbles. I highly recommend getting an all-weather timmer and run the pump at night from like 10pm-7am. Photosynthesis offered during the plant through sun and plants in the pond es produces plenty of oxygen for the fish. This does not happen at night when they need the oxygen the most. Make sure to place the air pump in a ventilated container. I'm thinking I going to need to get a fan as well, as I have noticed the motor does get hot. I have mine in an old toolbox under an outdoor shelf that is sheltered from the rain. It does make a fair amount of noise, but it's not too loud that it bothers you. It has a 5-year warranty on the unit. You can't go wrong with this purchase. Its a must have if your planning on having fish and beautiful water clarity. I just got this a week ago, so I haven't noticed water clarity yet. I'm told it takes so months to see that result. Feel free to message me with questions you may have. For the first time in years, our pond is clear of algae! We have had massive fish die-off twice in three years. We had the water tested for chemical run-off from the surrounding fields, but the tests were negative. We did, however have a LOT of algae and it was determined that our fish died from oxygen deprivation. We finally took the expert's advice and installed an Aerator (we chose the AirPro Pond Aerator) and the algae was completely gone within a week! We now have happy, healthy fish! And a beautiful pond. Already seeing improvements after 1 month. I built my own box for budget purposes. Using to aerate 1/4 acre pond (about three weeks now). Very easy to get set up and running. The hardest part of whole process was trenching for air line. Otherwise, almost plug and play. I got a great deal on my pond aeration system! It was so easy to install and has done wonders for my pond! It turned my horribly 1 acre anaerobic pond to an aerated pond in just 2 days! We also added 4 gallons of Aqua Blue pond dye with bacteria and it is now a great pond!!! Unfortunately, so did a 4 1/2 foot alligator think it was a great place. We had to catch the critter and return him to the salt marsh he came from. My fish are so happy now and so are my beautiful frogs! This was really a great kit for my pond! I have had it in the pond for little over a month and this is a great working product. Was an easy instal and setup highly recommend that. We are in the middle of upgrading our WWTP. We are down to one "Bio-reactor" as opposed to two. In our one operating Ditch we had one of two rotors fail and had to get air into the ditch as soon as possible. These two units have done the job. We are going to place both of them in our new EQ basin as soon as we go operational with our upgrades. This will help with limiting the odors produced in the basin and help with "bug" growth prior to introduction to the main process. Ran over 250 feet of 3/8 tubing to the diffuser and it works great....awesome product would give 10 stars if I could. HI, I have about a 1/4 acre pond that is about 8 feet deep. A. Is this the correct size pump for my pond? B. My pond is an unusual shape (see diagram) with a 20' wide x 30' long x 5-6'deep area. I am assuming i need a 2nd diffuser to ensure good circulation? Or not? C. There is about 150 feet from where the pump will sit to the deepest area of the second part of the pond. Do the 2 diffusers connect together (to make a single run) or do will there be 2 separate lines coming off the pump? D. How much line do I need to order? A. Yes B. For a pond with an odd shape like that I would recommend a 2nd diffuser. C. No you can not connect them together each diffuser will have to have separate air lines. D. It is hard to tell since I don't know the distance of that first run but from looking at your diagram I would say anywhere from 200' to 250' that will cover both runs and if you need to connect 2 pieces of tubing together we can provide you with couplings and hose clamps. I would have to order the 230v version. I'm assuming I could not also install a cabinet with a fan since the fan is only rated for 115 volts ? We have a 230v version of the fan. Also, Can you tell me how many psi it runs? Rocking piston compressors operate at approx. 30 PSI. If I wanted to add another line in the future, I would need to buy another weighted hose and manifold correct? If so, what would that cost be? Also, if our energy cost is $ .16 per kWh what would it cost to run 24/7? Yes you would need a valve manifold and more weighted tubing may be needed depending on how far each run will be. You can actually get the additional manifold + diffuser plus more tubing right from the product listing page above. Just look at the options right above the Add to Cart Button. Also there are add on accessories right below the add to cart button as well. If you scroll down far enough you will see the tubing. On average it costs about $0.50 per day to run this unit. my pond is 100x300 and at it deepest point 9' but stay 7' till 20' from edges. how many diffusers do i need and what size pump? Is the compressor waterproof and can it be placed outdoors exposed to the elements? We live in Michigan, so we are wondering if running this in the winter will affect the ice formation? Also, is this something you should run all the time? It acts as a decier in the winter time leaving a large hole in the ice over the diffuser. In extremely hard freezes the hole might freeze or get a thin layer of ice, but as soon as the temperatures go up again the hole will return. It is good thing to have winter aeration, not a lot of people realize this but toxic gases trapped under the ice could potentially cause a winter fish kill and having the hole in the ice would help that escape. What would the power consumption be in San Diego California? These units cost an average of $0.50 per day and that consumption is if you ran them 24/7. My pond is only about a 1/4 acre but is 12 ft deep in the center. Will this model suffice? Yes this unit will be perfect for your pond size and depth. Do you carry these for a 1500 gallon lily pond? How many diffusers can be attached to the airpro rocking piston pump? On this unit you can add 1 additional single head diffuser for a maximum of 2 diffusers. I have a dock at my ponds edge with Regular 110 house electric. Will this power this unit.? Yes this is compatible with 110v just plug and play. The compressor has a standard 3 prong plug just like any house hold electronic device. Can I run one airline from your compressor installed in my pole barn approx. 500' and split to 2 diffusers at the pond. Yes if you want to do an install like this give us a call and we can get you fixed up with the proper fittings and parts. Here is how it would work: 1. You would go from the compressor to your airline and we would recommend on a 500' run with this system using 1/2" or 3/4" airline. We could provide for you all the fittings that you will need. 2. Then you will go from the airline to a valve manifold because you are using 2 diffusers. You will need the valve system in place to control and regulate the airflow to each diffuser. You can bury the valve manifold near the waters edge inside one of our valve boxes. 3. Connect your weighted airlines to the valve manifold and go out into the pond and of course that airline is connected to your diffusers. *A lot of our customers use rigid PVC pipe schedule 40, the same kind used in plumbing applications for their long run to the pond. Alternatively you could use flexible poly or vinyl tubing. Only about 3 foot long. If you need to go further we recommend running more airline as opposed to using an extension cord. I bought this unit and have been running it. It seems to get pretty hot in the cabinet while running. is this normal? Yes they do run hot and they are hot to the touch, I would not recommend touching one that has been running for awhile. Yes you can definitely do that. In fact you could run up to 1000' of airline before you would have any significant volume and pressure loss. A 1" line should work fine you could probably go as small as 3/4" but I would not go less than that on a 500' run. My pond is 700 feet from barn where I have power. Can I trench in larger tubing and put pump in barn? How noisy is the pump? Also, can I add 50 feet of additional tubing (if so is there an adapter that connects the tubes? 1) Should the compressor to be installed on a pedestal? How high? 2) I am planning to not run it in a winter as I don't see the reason to run it all year around. My pond gets frozen in a winter, but fish survives under the ice cover. Depth of the pond varies from 6 to 9 ft. Will the compressor, its parts and its motor winding survive NY winter temperature while not running, but being covered? Thank you. 1) No that is not necessary unless the area near your pond is prone to flash flooding. A pedestal is not necessary but you will definitely want to find some type of enclosure to protect it from the elements. 2) Yes it should survive the winter no problem. However, you may want to bring inside of a shed or garage for the winter if you are not going to use it. You can attach a rope to the diffuser base and connect it with a duck decoy or milk jug and pull up the diffuser that way in the winter. The quality of the motor is more than good enough to survive but if it is not running in the winter for the sake of the maximum longevity why not just store it for those months if it is not in use. That is my thoughts. Now if you have it inside of a well insulated shed you could leave the airline and diffuser connected inside the pond and that should not be a problem, I would primarily be concerned about the bitter cold on the motor, not running all winter. Just on a side note it is good to keep these running during the winter even in climates where the pond freezes because it can leave a nice hole in the ice and allow toxic gases to escape, preventing potential winter fish kills. For this unit you are looking at approx. $0.50 per day in electricity cost to run it 24/7. I would recommend a surface aerator for anything 5 foot deep or less. The diffuser systems work great but they need at least 6 foot of depth to really do their thing properly. In your case I would recommend a surface aerator. Surface aerators are easy to size you will need 1 HP per acre. By my calculations you have 60,000 square feet which is almost 1.5 acres. Therefore you will need at least 1.5 HP for a surface aerator. Since they do not make a 1.5 HP you have 2 options get (1) 2 HP unit or (1) 1.5 HP and (1) 0.5 HP. Here is a link to our surface aerator page: http://www.livingwateraeration.com/aeration-systems-surface-aerators.html To answer your other question it may benefit you some to aerate just your side, but ideally you would want to aerate the entire pond for best results. How easy is it to move the Air ports around to other areas in the same pond? To help with water movement in different locations? It would actually be quite easy to do this. I would recommend tying a rope around the base of the diffuser and at the other end you can tie a duck decoy or milk jug, just so long as it is something that floats and something you can see on the surface and grab from a boat. Just be sure that you tie a rope and do not try to pull the diffuser up by the airline as this can break the barb fitting and you can potentially lose the diffuser. I have a fountain that I need a filltration system. Is this unite ok for that. It depends what you mean by filtration system. One of the key things that diffused aeration will provide for you is to reduce the excess nutrients in the pond and also help reduce sludge on the bottom. Both of these benefits will help keep your pond cleaner and looking great, with no bad smells and will help reduce algae, weeds and will keep your pond from getting too green. So in that sense yes, you will have a lot less bad stuff in the pond including excess nutrients, sludge, algae, weeds etc... However it does not filter the pond per se like a traditional pond filter would do on a garden pond or koi pond. Yes. This comes with a 2 year warranty on the compressor, a 5 year warranty on the airline and a 5 year warranty on the diffuser.